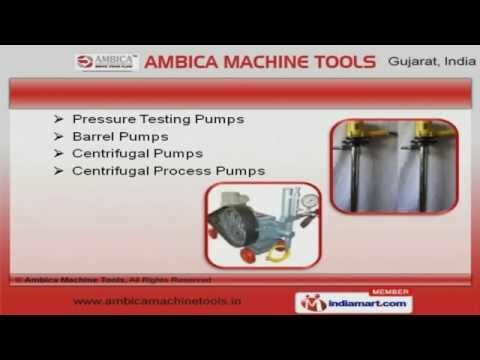 Welcome to Ambica Machine Tools, Manufacturer of Industrial Pumps and Gas Cylinder Accessories. An ISO 9001 2008 and N S I C certified company, established in 2006 at Ahmedabad. Experienced R and D department and Expansive distribution network make us different from others. Superior quality products, large production capacity and Utmost client satisfaction are the plus points of our organization. We offer a huge gamut of Hydro Testing, Triplex Plunger and Electric Motor Operated Hydrostatic Pumps. Barrel, Centrifugal and Pressure Testing Pumps offered by us are extremely reliable. We present a unique range of Polypropylene, Acid and Vertical Polypropylene Pumps that are cost effective. Our Chemical Process, Sewage and Rubber Lined Pumps are available at industry leading prices. Electric Motors, Pump Spare Parts and Chlorine Gas Cylinder Accessories are acknowledged for their functionality. We have gained tremendous expertise in providing Centrifuge Machines, Monoblock and Engine Drive Hydro Test Pumps.